Chat made the unfortunate key shortcut of command-L to mean "log out of AIM". That might seem ok at first glance, but it's the same as the "Open URL…" shortcut in most browsers. Often it happens that I thought I did switch over to my browser quickly, and tried to bring up a site, only to realize that i just logged off of the chat I was just in the middle of with someone. Gah. Happens about once a week to me. But my gripe isn't to complain about an iChat shortcut, but to bring up the broader point that the OS lets you change shortcuts you disagree with. It also lets you add shortcuts for anything in any menu that doesn't already have one. 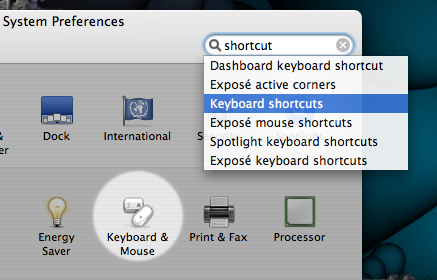 Just open up the System Preferences, go to Keyboard & Mouse -> Keyboard Shortcuts, and hit the little "+" key to add a new shortcut. You may have to point the drop-down menu to where iChat is if you've moved it, as I have. 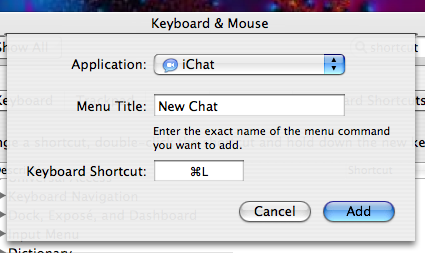 Then I just changed command-L to open a new iChat window, just to make it do something innocuous. Season to taste. 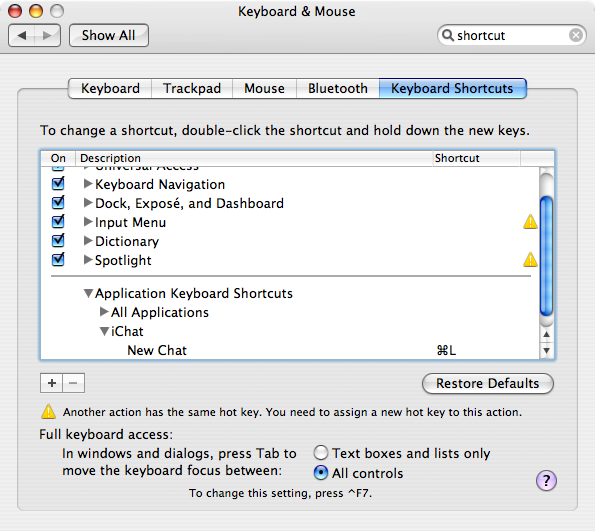 If you ever forget or want to edit later, it's all in the listing of keyboard shortcuts to change or zap later. So did you just make a new shortcut that overrides the default one, or did you first delete the command for logging out? The new shortcut overrides the default one. You can't delete the command for logging out as far as I know. Do you see apple-L in both locations in the menus? No, the System Preferences don't show shortcuts which are particular to an application except those you've customized in this way.